Where a media query relates to issues that fall within the scope of benefits of membership, we can advise and assist you on how best to handle media attention. Early advice from the MPS Press Office can help mitigate risks. We can help you respond to the media and deal with them on your behalf. Your first contact is likely to be with a Medicolegal Adviser and they will advise whether the MPS Press Office should be involved. Handling the Media has been updated and redesigned to reflect members’ needs and the current press environment. 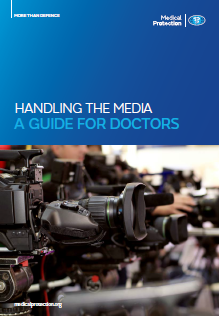 Significant additions to the guide are chapters on reporters at legal proceedings, undercover journalism, and social media and discussion sites to reflect the current investigative and online press environment, where doctors can get caught out. Media advice from MPS is available 24 hours a day, seven days a week.